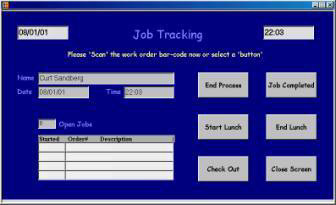 JobTraK is designed to track work order progress, work order costing, and employee time for each work order line item. When connected to Thoroughbred® Solution-IV Accounting®, job cost information is produced identifying the workstation cost, labor costs, and the inventory cost in either a detail (by process) or summary (by work order) report. 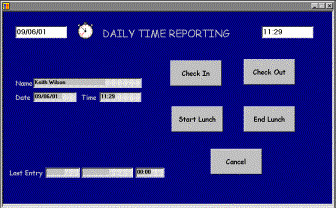 In addition, employee time is tracked and recorded into the TimExpress Time & Attendance module and is automatically imported into the Solution-IV Payroll system. Tracking time, work orders, scheduling and payment of employees is streamlined to save time and expense. The TimExpress system includes 2 Modules, JobTraK (shop floor work order tracking and costing), and TimExpress (Time & Attendance recording). "Direct" employees will use the shop floor portion of the system and "Indirect" employees will use the time & attendance portion of the system. The system will route them to the correct screen automatically. JobTraK uses bar code information that is produced with the work order and is used to track the routing steps/processes. At the start of each new process each employee has a bar coded employee badge that is swiped along with the work order bar code. The workstation in-out times are recorded along with the employees' in-out times. Employees can work on multiple processes or several employees can work on one process at the same time and the time is automatically applied to the correct process(es). The work order follows the routing steps until the job is complete. Touch Screens can be used for all selection processes by employees. (Keypads and keyboards are also available) Views and reports can present the current active process of any job or employee. Reports also present summary and detailed information on each work order, including workstation, time and inventory cost. Thoroughbred, Solution-IV Accounting, and OPENworkshop are registered trademarks of Thoroughbred Software International, Inc.